Fort Lauderdale, once an entertaining place for college-aged Spring Breakers, is now an amazing place to call home as well. It’s sometimes known as the “Venice of America” because of its intricate and beautiful canal system. It features twenty-three miles of beaches and 300-plus miles of Intracoastal waterways and canals making it the kind of town where you feel like you’re on vacation all the time. This canal-filled neighborhood has several smaller neighborhoods: Nurmi Isles, Seven Isles, Idelwyld, Riviera Isles, and Los Olas Isles. Located off of E. Los Olas Boulevard just west of Fort Lauderdale Beach, the homes average around $711,176 – $915,902 (depending on the smaller neighborhood section) to buy and $1,404 for rent in this coastal neighborhood. The water is the appeal in these canal neighborhoods. In this boating community, speed boats, kayaks and sail boats are as common as lawn ornaments in the midwest. There are also a number of beautiful yachts in this neighborhood. The community is gay-friendly and largely made up of professionals. 43.7% of the residents consist of married people with families. Being near the beach and downtown makes it ideal for professionals. This is clear in the large number of residents with advanced degrees. It is also among one of the safest in Fort Lauderdale and an amazing jewel during the holiday season when many climb aboard boats to view the spectacular light displays from the water. Located between North Dixie highway and North Federal Highway, Imperial Point is very close to I-95. The homes average around $352,000 to buy and $920 for rent in this trendy area. While it is hip and trendy, it is also a walkable community and generally quiet. The homes are mostly owner-occupied. It has a large percentage of young singles and is gay-friendly. Forty percent of the residents of Imperial Point are maried couples with families. The local elementary school received high marks from Greatschools.org and was recently awarded an “A” for outstanding success on the Florida Comprehensive Assessment Test (FCAT), the test to assess the degree of learning of Sunshine State Standards. The neighborhood largely consists of people with advanced degrees and it’s one of the safest in Fort Lauderdale. Sailboat Bend is a unique community, close to downtown. While only a couple of years ago it was known for a high crime rate and dubious illegal activity, a group of supporters drove out the criminal element and went about restoring the old “cracker” houses to create a colorful artsy professionals community. The New River forms the southern boundary line of Sailboat Bend and Broward Boulevard the northern boulevard. The percentage of married couples with children living in Sailboat Bend is 37.8%. The local elementary, junior high and high schools have average ratings, which are common for inner city schools. This area has only recently been re-gentrified so school improvements will most likely continue to occur. The median rent in this neighborhood is $984, while the average house is $304,000. Another great affluent community on the water, Rio Vista has long been seen as one of Fort Lauderdale’s premier places to live for families. It boasts unique architecture and its close proximity to downtown is forgotten amidst tranquil, tree-lined streets. Most homes have docks, even many of the smaller ones, with which to take advantage of the canals or New River access. The median rent paid in this area is $916, while the average house costs $771,000. About forty percent of the residents in this neighborhood also consist of married couples with children. The local assigned elementary school received a 7 out of 10 from Greatschools.org. Zillow predicts this area may see a slower increase in home value than many of the surrounding areas. While most of Fort Lauderdale is in a marsh, Colee Hammock, one of the oldest neighborhoods in the Fort Lauderdale, sits on a hammock, or higher ground. This means purchasing here will save you from the dreaded, overly expensive cost of insuring property in a flood plain. While most of the homes in these areas are over 70-years old, the community made an effort to restore these properties. This is a very diverse neighborhood with residents who are independently wealthy and working class. The median rent in this area is $1,069, while the average house price is $780.609. 60.8% of the neighborhood’s residents are families with children. Colee Hammock and Victoria Park share the same local elementary school — Virginia Shuman Young Elementary — (a Montessori magnet school) which received a 10 out of 10 from Greatschools.org. 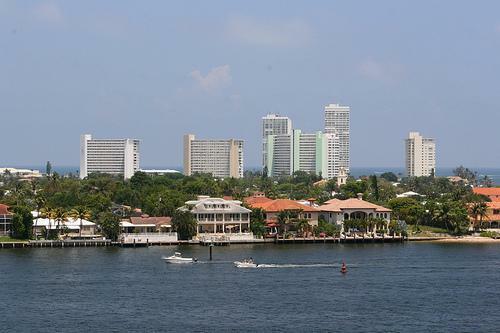 Zillow predicts this area will experience a higher rise in home values than the rest of Fort Lauderdale. With its beautiful restored mid-century homes, Victoria Park is another downtown neighborhood that has made the list. Stroll down tree-canopied streets and enjoy the lush greenery of the old South. The neighborhood association is very active and the community boasts over 10,000 residents. This downtown neighborhood is close to the beach, shopping, dining and the water. According to its website, it is a diverse community known for its tolerance. Living here means you are part of a neighborhood that takes its community very seriously. The local elementary school received a 10 out of 10 from Greatschools.org. and Zillow predicts this area will see a slightly higher rise in home values than the rest of Fort Lauderdale. Whether you’re looking for a nice family oriented neighborhood or a coastal get-away, Fort Lauderdale has many unique enclaves to choose from. Finding one that suits your personality is easy, deciding which home to call your own may pose a more difficult decision as there are so many beautiful options.